You just hit it. The 3 o’clock slump. We all know it- the fogginess, the headache, the irritability and the desire to stop all of the work that you’re in the middle of, put your head on your desk and just take a nap. Trust us, we understand! 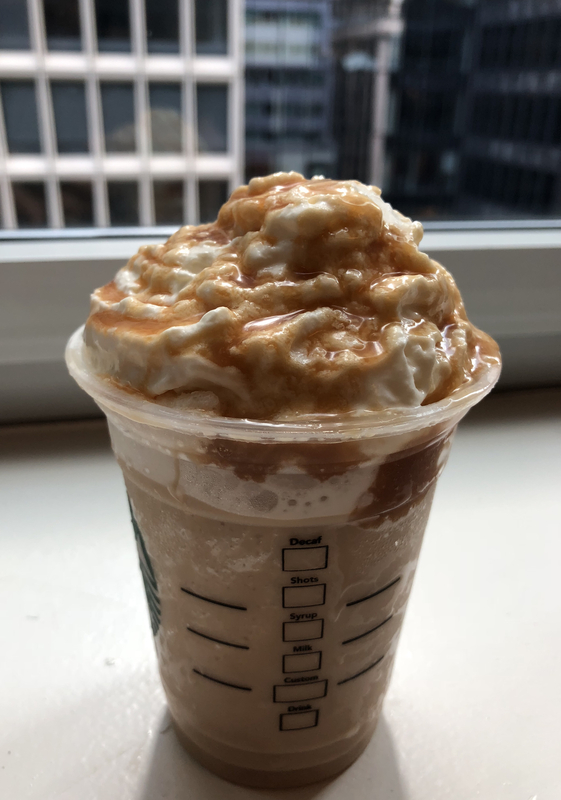 But when you sprint out of your office to get a latte or a frappuccino or a macchiato at Starbucks or Dunkin or your preferred coffee vendor, you may get a temporary jolt of energy but you’re actually causing harm to your body in the long run. Coffee itself isn’t bad. Since it contains caffeine, which is a stimulant, it can increase energy levels, improve memory, enhance brain function and break down body fat. It’s also the number one source of antioxidants in the U.S. and can help protect against various diseases such as type 2 diabetes, Parkinson’s and liver cancer. However, it’s when we add sugar and syrups to our coffee that we add in calories and fat and create a need for more sugar. Added sugar is one of the most highly addictive ingredients in the modern diet. When we consume added sugar, dopamine is released in our brain, creating a “high” that our body registers as a reward, causing it to crave more. As we give our bodies more and more added sugar, it builds up a tolerance and releases less dopamine, which causes us to consume more of it to experience the same “high” as before. Unlike natural sugar found in fruits, veggies and proteins, added sugar can cause weight gain, increases your risk of heart disease, diabetes and cancer and actually drains your energy faster, because it causes only a temporary spike in blood sugar that drops soon after. Which is why every day at 3PM, your craving for sugar will hit again and you feel the need to quench it with a sugary coffee, creating a vicious cycle of highs and lows. The 2015-2020 Dietary Guidelines for Americans recommends no more than 200 calories (50 grams) of added sugar each day. Although too much sugar can be harmful, it’s still necessary to give us energy to keep our bodies and brains moving. But every once and a while, we all need a boost. Between work, families, friends.. we all have reasons why we don’t get as much sleep as we should or would like to. So next time you’re feeling the slump, instead of ordering that PSL (which contains 50 grams of sugar aka the amount you’re allotted for one day! ), try out one of our suggestions below! It will still give you the caffeine boost that you need, without comprising on the added sugar. Green Tea: Although green tea has a lower caffeine content than coffee, it will still give you the boost you need without making you feel wired or jittery. It also has a lot of health benefits- it’s high in antioxidants, helps to boost your immune system and decreases the risk of diabetes. The best part about green tea is that most coffee shops sell it and it’s also easy to find green tea bags in your local grocery store to make it on your own! Matcha: Matcha is a type of stone ground Japanese tea that comes in a powder form. Unlike other green teas whose leaves get steeped in hot water, matcha is created from actual tea leaves that have been ground up. Again it doesn’t have as much caffeine as coffee, but it helps with memory and focus while still being energizing. However, matcha does have a naturally bitter taste so some places will sweeten the powder with added sugar. If you’re interested in matcha, make sure that the tea you’re getting is a good quality matcha. Unsweetened Iced Tea: Fresh brewed tea is high in caffeine and rich in antioxidants, making it one of the best alternatives to coffee. It helps reduce the risk of stroke and improves heart and gut health. The great thing about unsweetened iced tea is that you can sweeten it naturally (if needed) by adding sugar substitutes such as honey or lemon, which will make it less bitter as you get used to the taste. Dark Chocolate: Dark chocolate has only a small amount of caffeine in it, but it’s a good substitute if you find that you crave the sweetness of coffee more than the coffee itself. Rather than reach for a sugary drink or dessert, dark chocolate is a good way to curb the craving because it also reduces cholesterol, lowers blood pressure and is rich in nutrients. Black Coffee: If you love the taste of coffee and just can’t avoid it, simple black coffee can always be a fall back option. As we mentioned above, it can increase energy levels, improve memory, protect against a number of diseases and is high in antioxidants. So if you want to keep the coffee taste, try cutting out the added sugar, syrups, milk and cream. That way you’re getting the natural benefits of the coffee and, of course, the caffeine.